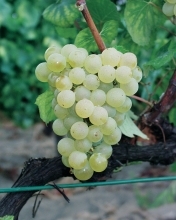 No synonym is officially recognized for this vine variety.In the European Union, Chardonnay B can officially be designated by other names: Chardoney (Bulgaria), Feinburgunder (Austria), Morillon (Austria), Pino shardone (Bulgaria) and Pinot Chardonnay (Cyprus). Bud burst: 1 day before Chasselas. Chardonnay B is generally long pruned. However in areas with favorable climatic conditions for floral initiation, vines may also be pruned short. This variety is suited to moderately fertile soils with dominant limestone or marly. In Mediterranean areas, intense drought situations are to be avoided. 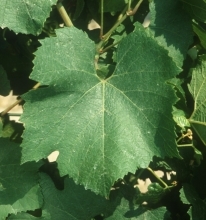 Chardonnay B is susceptible to powdery mildew and to grapevine yellows due to phytoplasma. On the other hand, it is not prone to downy mildew. At the end of maturation and under strong vigor situation, grey rot may cause substantial damage. The grape clusters and berries are small. This variety has an extermely high potential for quality and is used to produce dry white wines, sparkling wines and even liqueur wines. The sugar content of the berries can reach high levels while maintaining high acidity levels. This is what enables the production of particularly well balanced, powerful and full bodied wine (rich and with volume). The typical aromas are complex and intense (dried fruit, hazel nut, grilled flavor, exotic fruit, butter, etc). Chardonnay B is likewise suited to fermentation and barrel ageing. The thirty-one approved Chardonnay B clones carry the numbers 75, 76, 77, 78, 95, 96, 116, 117, 118, 119, 121, 122, 124, 125, 128, 130, 131, 132, 277, 352, 414, 415, 548, 549, 809, 1066, 1067, 1068, 1145, 1146 and 1147. A conservatory with over 340 clones has been set up in Saône-et-Loire in 1994. Varying vigor and production depending on regions. Manage production for use in still wines. It can likewise be used for making sparkling wines. Clone appreciated for its steady production, its agronomic characteristics and the quality of wine produced. It can likewise be used for making sparkling wines. Productive clone, adapted to making sparkling wines. Clone appreciated for its steady production, its agronomic characteristics and the quality of the wines produced. It can likewise be used for making sparkling wines. Steady production, manage production for use with still wines. It can likewise be used for making sparkling wines. Clone adapted to making sparkling wines. Clone appreciated for its agronomic characteristics and quality of wines produced. It can likewise be used for making sparkling wines. Manage production for its use with still wines. It can likewise be used for making sparkling wines. Manage production for its use with still wines. This clone can likewise be used for making sparkling wines. Varying vigor and production which needs to be managed to obtain sufficient quality level. Early maturity clone, appreciated for its agronomic characteristics and the quality of wines obtained. Small grape clusters with considerable millerandage. Early maturity clone, appreciated for its low production, its high sugar content and the quality of wines obtained. Use for blending and for high added value productions due to its low yields. Clone appreciated for its agronomic characteristics and quality of wines produced.